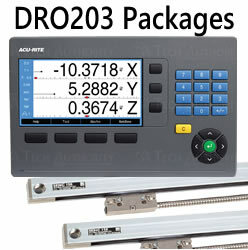 The DRO203 is Acu-Rites` newest generation of digital readout packages. The DRO203 features a three axis exclusive crystal clear LCD color display, which replaces the traditional LED and VFD readouts still used by other manufacturers. The DRO203 offers a standard color 5.7in LCD display, the latest in flat screen technology. The DRO203 offers intuitive prompts, instructions and help functions on the screen. In addition, all standard routines are now visible on the screen with graphics to guide the user through simple questions. It is no longer necessary to constantly refer to a manual or memorize codes, to access the functionality of the DRO203 system. Acu-Rite is thinking ahead for the end-user with a universal 3-axis display, complete with bolthole pattern calculations for full and partial circles with graphics, zero reset and preset features, tool diameter compensation, near zero warning, and other common operating features.